► Celebrate the historic health care reform legislation that recently passed in Vermont's House and Senate. 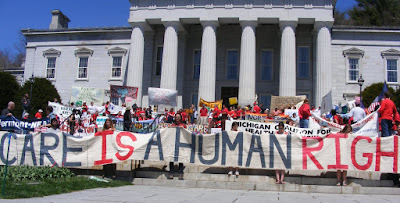 The Center launched the health care campaign in 2008 to call attention to the health care crisis facing the state and to demand health care as a human right for all. Rather than focusing on a particular form of universal healthcare, the Center made human rights principles -- universality, equity, accountability, transparency, and participation -- the core of its campaign. Specifically, it asserted that everyone is entitled to quality health care; that the health care system must be accessible to all and without any systemic barriers; that the costs of financing the system must be shared fairly; and that the system must be efficient, transparent in design and accountable to the people it serves. The human rights principles at the heart of the campaign are derived from international law. Article 12 of the International Covenant on Economic, Social and Cultural Rights declares that all people have the right to the highest attainable standard of health. The Committee on Economic, Social and Cultural Rights that is empowered to monitor implementation of the Convention has interpreted the right to health to require the principles advanced by the campaign. By framing healthcare as a human right, the Center has been able to mobilize thousands of Vermonters, many of whom have not previously been involved in political campaigns, to demand universal healthcare. This grassroots movement successfully pressured the state legislature into passing significant health care reform legislation in 2010 and 2011. In 2010, the Vermont Legislature passed Act 128, which set the stage for universal health care by establishing a commission charged with hiring an independent consultant to design three universal health care models. The Act declared that health care was a public good, and incorporated the human rights principles. In January 2011, as posted earlier, Dr. William Hsiao, the independent consultant hired by Vermont, presented three models to the legislature. He recommended that the state adopt a system of single-payer health care. Under this kind of system, (of which Medicare is an example) universal health care is financed by the public and administered by the government or a government sponsored entity who pays all claims. Hsiao’s recommendations were incorporated into health care reform legislation which was passed this spring. The legislation creates a framework for developing Green Mountain Care, a universal single-payer health care system. The final version of Vermont's health care reform bill has cleared the House and Senate and has been presented to Governor Peter Shumlin for his signature. Because the governor has staunchly supported this legislation, it is extremely likely that Vermont will be the first state to begin implementing a single-payer health care system. Both the House and the Senate versions incorporate the human rights principles. The legislation requires the state to ensure universal access for all Vermonters and ensure that systemic barriers do not prevent anyone from receiving the health care they need. In addition, the legislation must be transparent in design and operation; accountable to the people it serves and ensure public participation in the design, implementation, evaluation and accountability mechanisms of the health care system. ► First, the Vermont Workers’ Center is concerned that the bill is more focuses more on containing costs, than on providing health care as a basic human right for all Vermonters. ► Further, the legislation refers to the human rights principles, but does not explain how these principles will be achieved. ► In addition, many of the hardest decisions regarding the benefits package, financing system and provider reimbursement rates have been put off for the future. This delay may make it easier for interests opposed to a universal single-payer health care system to weaken reform. 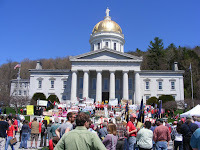 For example, the legislation was watered down in the Vermont Senate due to the influence of business and insurance lobbyists opposed to a universal, single-payer health care system. The current legislation is not perfect, but it is, nonetheless, a major achievement. Rather than being content to celebrate the historic health care legislation that has passed, however, organizers and volunteers continue to try to make it better. On Monday, for example, they persuaded legislators to drop an amendment that excluded undocumented immigrants from Green Mountain Care. The momentum for universal health care continues to grow as Vermonters heed this call to demand health care as a basic human right.